If the Swedish deathglam band's last outing on 'Night Electric Night' felt a little like treading over the same ground as their breakthrough album 'Termination Bliss', then their latest offering should serve to restore your faith a little. The band's fourth album sees many of the themes and motifs of the previous two albums return, and their NDH influenced sound is still at the core of this release. Yet the energy is more positive and the songs display a bit more variation to keep things interesting. The albums big numbers retain the formula of past hits such as 'Blitzkrieg' and 'Cyanide' with the melodic synths, hard NDH guitars and sing-a-long choruses intact. 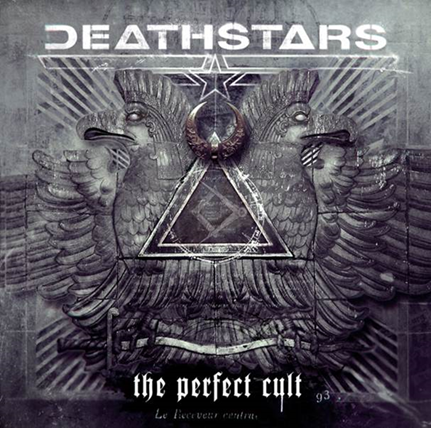 The lead single 'All The Devil's Toys', 'The Perfect Cult', 'Asphalt Wings' and 'Temple Of The Insects' all proudly fly the Deathstars flag and give the fans exactly what they expect. However the band still have a few tricks up their sleeves with the likes of 'Explode', 'Bodies', 'Track, Crush & Prevail' and 'Noise Cuts' playing with the formula and stripping back elements of the established formula to great effect. Though the songs don't really get anywhere near as daring as the likes of 'Syndrome', they do just enough to vary the pace of the album and give you a little more substance. The production, as you'd expect, sounds big and anthemic. Perhaps to the detriment of some of the quieter moments on the album. But it's mixed well and gives the listener plenty of bang for their buck. 'The Perfect Cult' could be seen as a return to form after the lacklustre outing of 'Night Electric Night' and the premature 'Greatest Hits' filler. The album still lacks that innovation and playfulness that was characteristic of 'Synthetic Generation'. However this will still tick the boxes for the vast majority of fans.